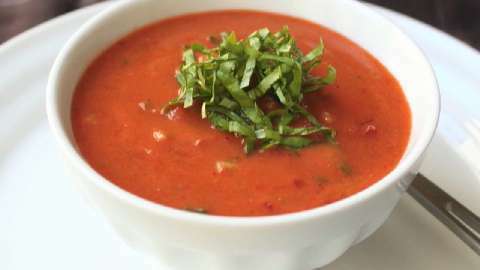 Gazpacho, the granddaddy of all uncooked soups, has several things in common with a smoothie. It’s a cold, thick liquid containing ripe, juicy produce. You make it in a blender. It’s refreshing on a hot summer day. 2. Taste and adjust the seasoning. Refrigerate for up to a few hours before serving or serve immediately, garnished with the avocado if desired. Reserve some of the coarsely blended mixture to add back after the rest is good and smooth. Garnish with shredded Basil.